The World of Warcraft: Cataclysm has wrecked havoc to a lot of our favorite places in Kalimdor. These outfits are to represent the Old Azeroth as it was, almost a sort of tribute to those zones that have been destroyed for good. Most of these outfits can be worn for other zones, as well; and not necessarily only in Kalimdor. I only focused on the zones I felt are most impacted by Cataclysm (I did not list all the zones because of the over-lap of these outfits), but, I will probably come back and add more later…maybe even for some of the new zones that will pop up ^_^. 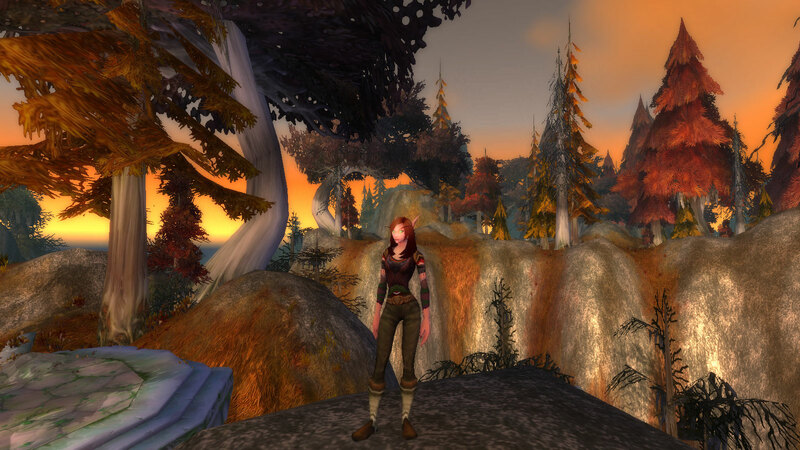 While I myself have never really been a true fan of the zone, Ashenvale is a major focus point in the lore of Kalimdor, especially between the Night Elves and Orcs. Cataclysm will not calm down the territory battle between these two factions. The Warsong lumber camps will expand, the peaceful Astranaar will be plagued with air attacks (sorry guys), and a huge volcano disrupts the very nature of the zone. 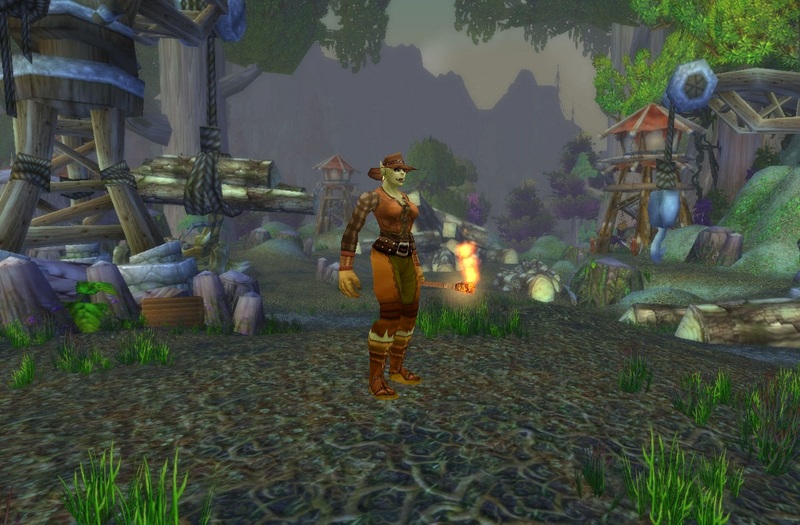 I wanted to stay rugged with these outfits due to the fact that the Horde presence in Ashenvale is based around the hard labor of the lumber camps. These type of items seemed to be a good way to incorporate that notion, while still allowing for a “girlie” alternative. There are several other armor pieces that can be used instead of what I listed. The Barkshell Tunic can be used instead of the Dokebi Chestguard, and the Brambleweed Leggings can replace the Dokebi Leggings. Instead of the Dokebi Mantle, you can use the Rugged Spaulders, and the Thistlefur Gloves can replace the crochet ones. 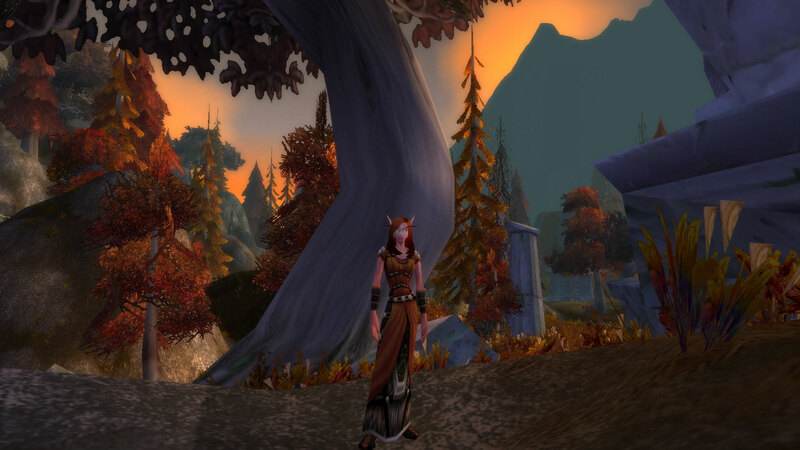 For the Night Elf-type outfits, I stayed in a brighter color range to stay with their spirit, and match more with the surroundings of the zone. A bright feminine outfit for you to consider ^_^. 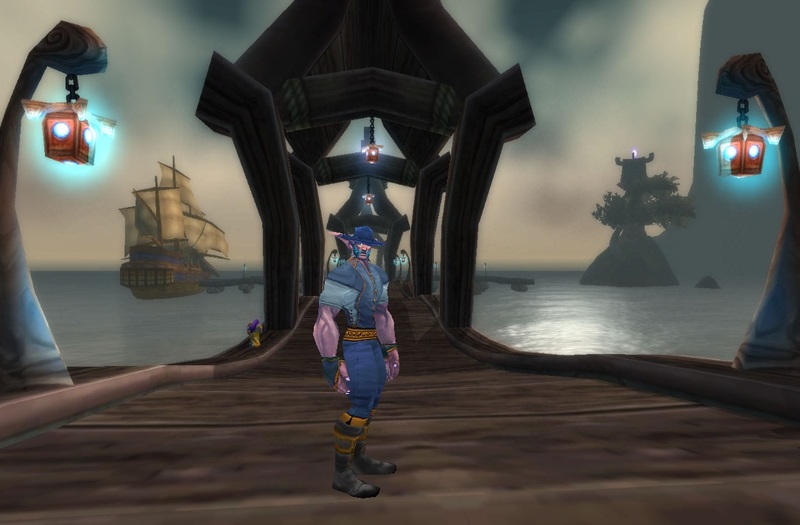 I think Night Elves look best in blues and purples, and the Barbaric Cloth Robe brings these colors into the outfit while still staying rugged and druid-like. While these armor pieces look great on either faction, I used them for a Night Elf outfit to stay within my chosen color scheme, but to also offer that mystical tribal aspect, too. The same style of this set can be found in other colors, like the Arachnidian Armor set (blue and gold) and the Eldr’naan Armor set (green and purple). There are a couple other armor pieces that can be used instead of what I have listed here. The Bog Spaulders can be replaced for the Haal’eshi Pauldrons; the Dragon Crested Epaulets (neutral quest reward) are in a different style, but share the same color scheme. The Ranger Leggings can be replaced for the Brusslehide Leggings. Any of these outfits can be worn also for the Stonetalon Mountains, which shares the same devastation of excess logging and volcanic activity. I remember trying to level, all those years ago, in Hillsbrad Foothills as a very newb level 19. Back in the day on Lightninghoof, there were regular “Tarren Mill pillaging”, which caused my leveling to go absolutely nowhere. Waddell took me to a far off land known as The Barrens, and the peaceful safari I encountered was so much easier. 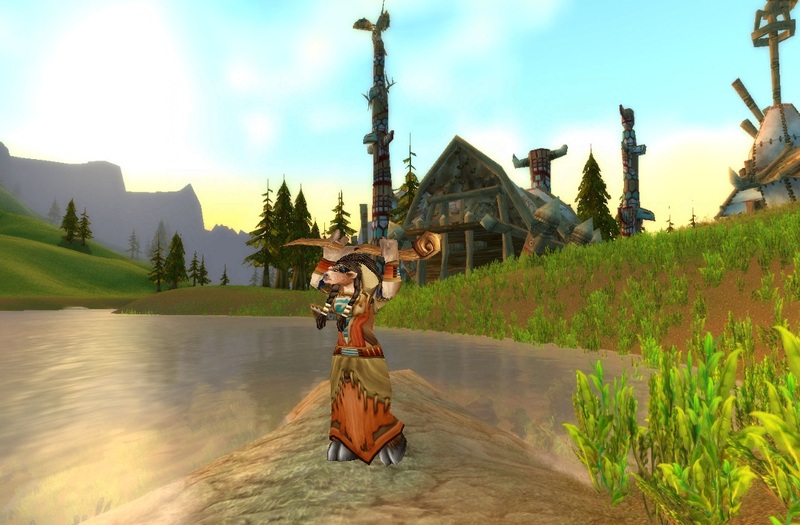 The Barrens is one of my favorite zones, and I will hate to see it broken in two by a volcanic crater and war-ridden. Poor zhevras…. This zone is predominantly Horde, so, these outfits reflect more to that side. A Horde member can not go wrong with a set like the Chieftain one. While this is not the only set in this same style, I chose this one for its Barrens-like colors of yellow/gold and tan. 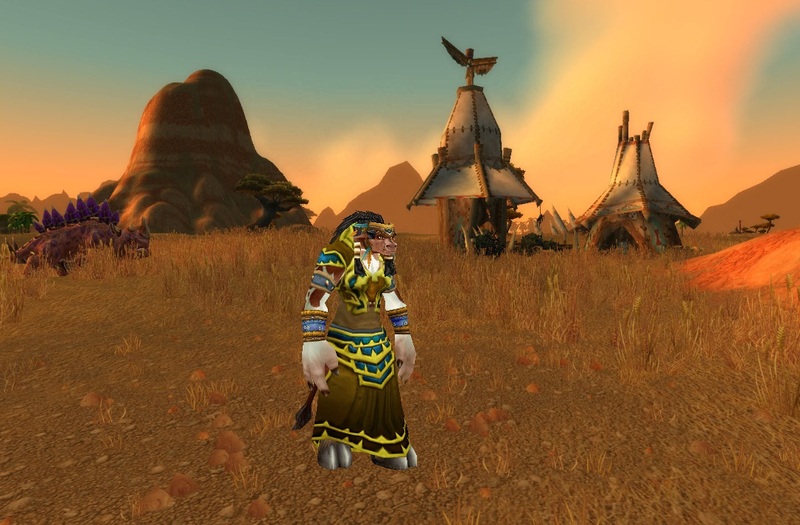 The Gaea’s Raiment offers this “tribal” feel without being too “feathery” or ragged; it’s also one of the more popular styles of robes amongst the Horde, too. 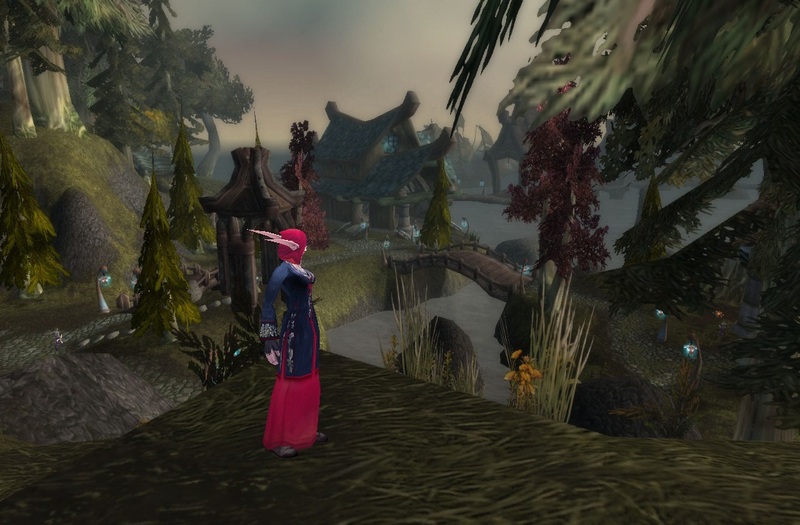 There are other robes in the same style as this one, such as the Windchaser Robe, the Twilight Robe, and the Highborne Robes, which also match the chosen color scheme for outfits in this zone. I used the Darkwater Bracers because they match the style of bracers/gloves worn by Orgrimmar Guards (like the Sentinel Bracers), but, by being blue, they match the robe. I felt the Squire’s Shirt also best matched this outfit if you desire to have a shirt equipped on your character; however, it is not necessarily needed. This outfit brings out the darker under-tones of the colors found in The Barrens (like in the vegetation around the zone). 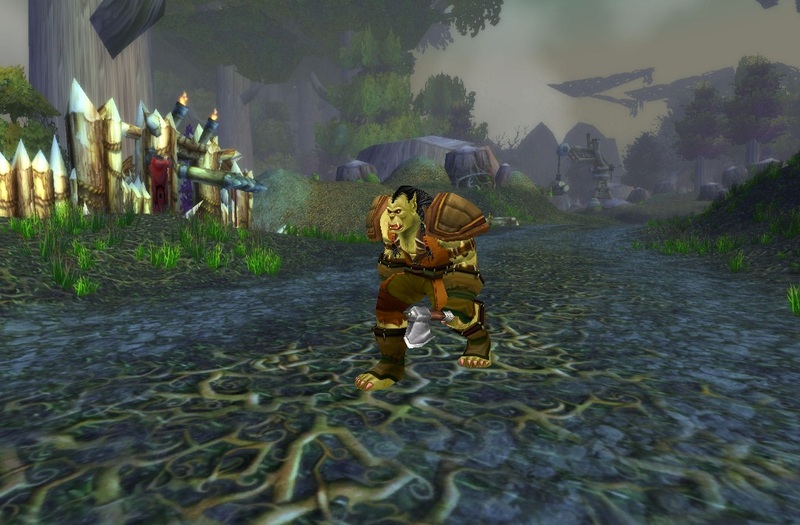 I do not think that the Gnoll Casting Gloves are available anymore since Cataclysm, but, they look the same as other rugged gloves of its type, such as the Herbalist Gloves. These outfits, along with some from the Shaman outfits article, make great outfits to wear in remembrance of classic Thousand Needles, too. While Mulgore is not destroyed, per say, like other zones, it is plagued full of new enemies that have taken control of the peaceful plains. 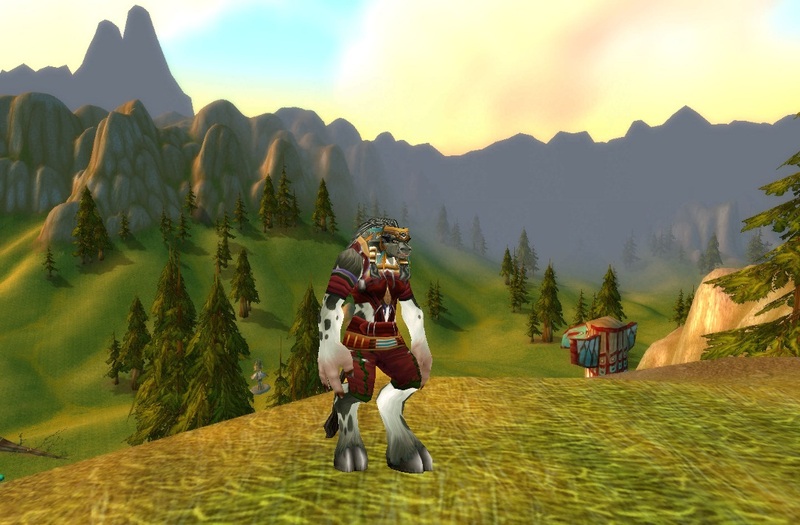 These outfits, in my opinion, represent this peaceful, tribal feel of what Mulgore was. Cairne Bloodhoof, you will be greatly missed. 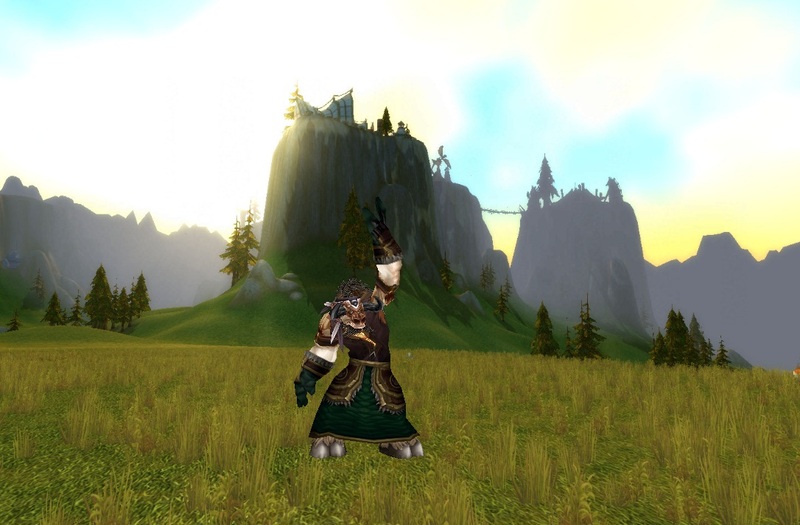 While there are many other robes similar to the Pilgrim’s Robe (like the Native Robe and the actual Tauren druid starter robe the Novice’s Robe), I choose this one because it includes a sort of “bracer attachment” that matches the Wise Man’s Belt. This outfit is a lot darker, but still very “Mulgore”. I choose the Spirit Hunter Headdress (Horde quest reward) to match the colors; a good substitute for this one is the Ruffled Chaplet, which is in the same colors, or any other feathered headdress will work, too. I got the Gloves of Dismal Fortune when no one else needed them from a Trial of the Champion heroic. Good thing I model viewed it before they disenchanted it – they match Kirina’s Giant-Friend Kilt perfectly! Like The Barrens outfits, these outfits can also be worn for the Thousand Needles, which is now flooded beyond belief. I have always thought of the classic Darkshore as a Night Elf Silverpine Forest, kind of quiet and spooky. It’s pretty dim, especially near the coast where the sun shines in a gray sky on the white beach. I’ve enjoyed my passings through Auberdine, even though I was stealthing around like a fugitive. It’s kind of sad that it has been destroyed now by Cataclysm. 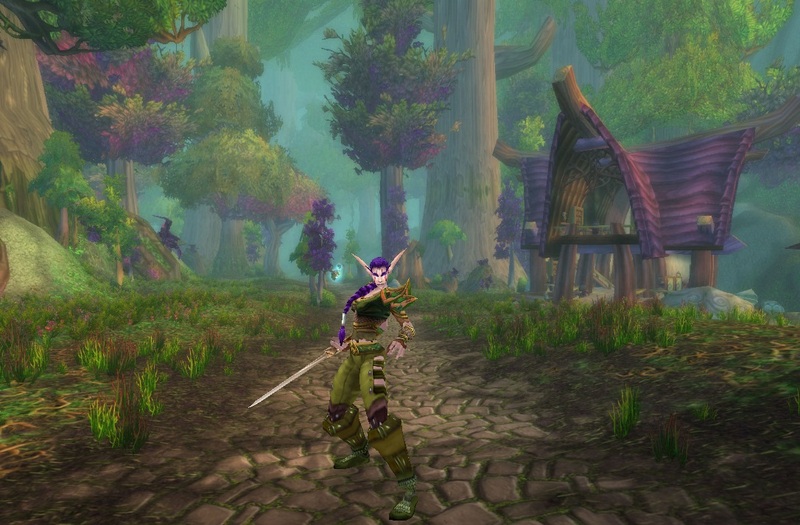 I tried to stay in the “dark forest” theme of the zone with these outfits, but also aiming to incorporate more of the vibrant colors of the Night Elf spirit. If you are lucky enough to have successfully farmed for the Formal Dangui, hopefully this simple outfit will work for you. The Interlaced Cowl is one of the few helms that I found matched the pink color in the robe. The elegant Devout Gloves compliments the purple and gold accents found in this outfit, and, they are pretty easy to obtain if your character can solo Stratholme. I also used the Haliscan Pantaloons just for the added flair along the sides of the pant legs – it matches the cuffs of the Purple Martial Shirt. This outfit is a little bit brighter, but still very effective. Instead of the Royal armor pieces, the Abjurer’s Tunic and Pants can be used. 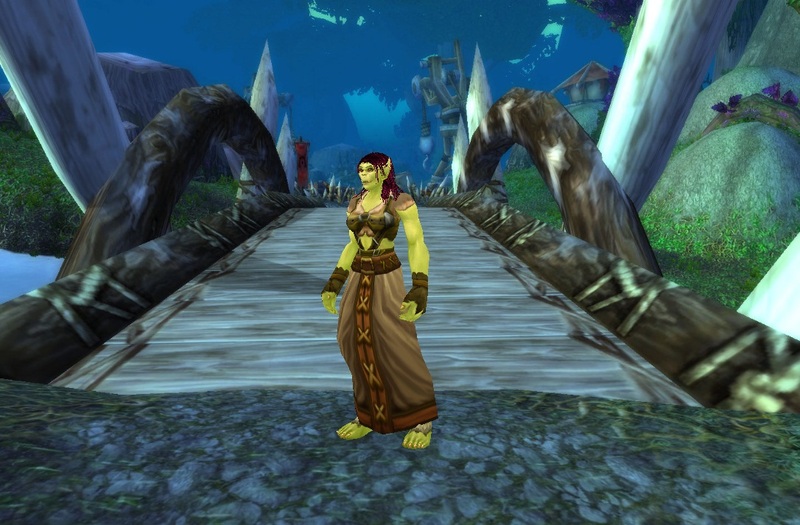 These types of outfits, along with the Night Elf Ashenvale ones, are great to wear in Teldrassil too. Other than the fact that it is now shaped more like the Horde crest, Azshara has not veered too far away from its classic autumn climate. I really love the Embersilk set, and, it’s so versatile even outside of Hallow’s End outfits. The Embersilk pieces, along with the Orgrimmar Doublet, pick up on the darker brown/black and orange accents in the Silksand Wraps without taking away from the tribal effects of the robe. The green tint to the Durable Pants match perfectly to the green accents in the Sanguine Armor. The Orgrimmar Doublet can be left out, or replaced for a darker shirt. The Impaling Harpoon dropped out of the Deadmines. It may still drop out of the same instance, but, it might have a “face lift” to a level 80+ weapon instead of its original lower level. A lot of the outfits in my Fall Outfits article can be worn in addition to these listed here, as those pictures were also taken in the beautiful Azshara. I could also see these outfits worn in other places, such as the in the Eastern Plaguelands. 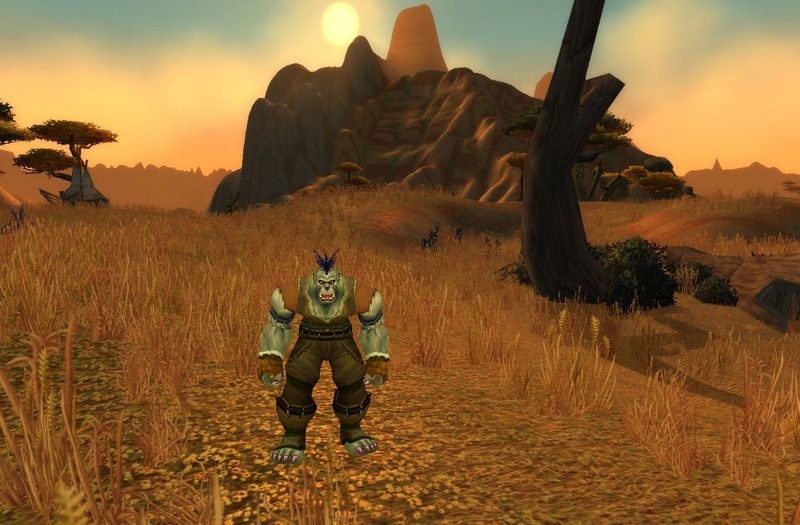 The zone-change information listed in this article was taken from: WoWWiki – WoW Cataclysm article.